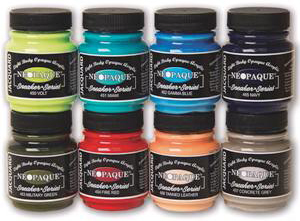 Set of all 8 of the new Neopaque Sneaker paints - wonderful retro colours that work beautifully together. Not just for sneakers - use on canvas bags, clothing, cushions - these multi-surface paints work on any natural and synthetic fabrics, leather, wood, canvas, clay, paper and more. Heat fix with an iron or hot hairdrier.